It’s the time it takes to clean that bugs me most. When I go at it, I go at it with both barrels. (Just like when I doubled down on the freshmen 15 in college.) Everything gets cleaned and organized — even the toothpaste cap and pantry. There are times when someone “pops” over without notice or I agree to host a jewelry/cooking tool/clothing party when I must rush the cleaning process. This is what I call giving my home the “illusion of clean.” Don’t open a door, you might get hurt. With three teenagers, we are always rushing. That being said, there are times when cleaning the refrigerator out gets overlooked… many, many times. So a few days ago, I decided it was time. Mostly, because I had run out of plastic storage containers and it was either buy more or clean out the fridge. If it were a crime to purchase produce, take it home and let it sit in the back of the fridge until it changes colors and shrivels to half its normal size; I’d be serving a life sentence in prison. After spending two hours throwing away, washing out and swearing that this will be the last time I ever wait this long to clean it out, the task was complete. It’s amazing how much brighter that interior light is when there’s not so much stuff crammed in. I don’t mean to brag, but it looked brand new. A few minutes later, I heard my boys bound down the stairs most likely heading to the kitchen to get a snack. When the pantry door shut I knew the fridge was next on their quest for sustenance. Suddenly I heard my youngest scream out in a terrified voice, “WE’VE BEEN ROBBED! 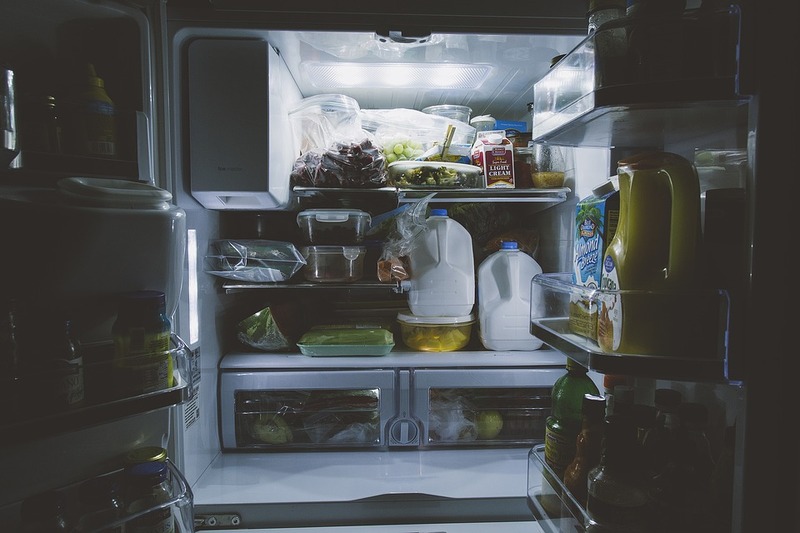 WE’VE BEEN ROBBED!” My husband and I ran into the kitchen where he was standing in front of the open fridge with a very confused look on his face. When he saw me he said, “Where’s all the food?” I had the opportunity to tell him the truth. That this is the way a refrigerator is meant to look. But, that would mean I’d probably get that all too familiar look from him. So I did what I had to do.